Renewables advocates keep pushing the idea that there may be ‘gaps’ in power supply due to intermittency. But most sensible people realise it’s the other way round – renewables provide a small percentage of the total power and everything else has to work around that. Here’s an example of the propaganda. 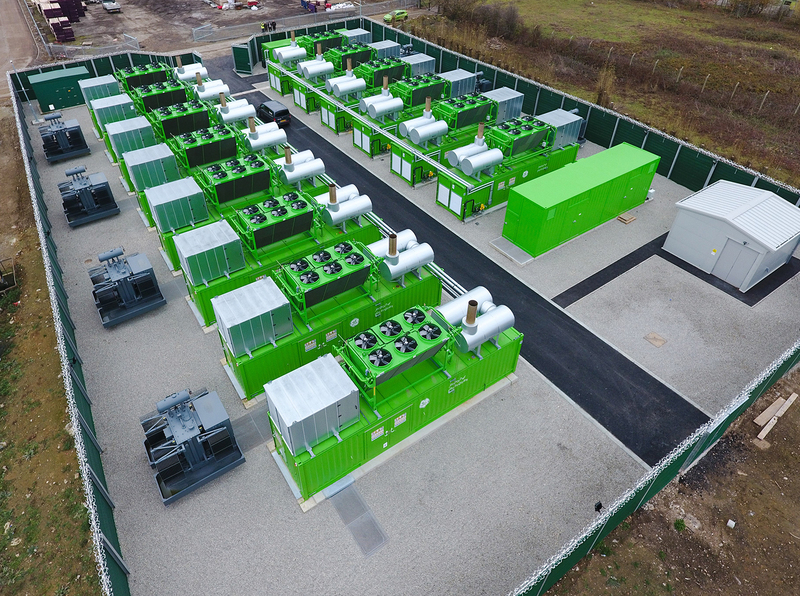 The Ashford Peaking Power Plant is a 21MW facility located at Kingsnorth Industrial Estate in Kent, reports Energy Live News. It has 14 gas engines on site, which runs for around 1,500 to 2,000 hours a year – it is fully automated, unmanned and is monitored and controlled remotely. Managed by AMP, it has won contracts in National Grid’s Capacity Market to provide electricity when demand is at peak and can be fired in up to two minutes from standby. Mark Tarry, CFO at AMP said peaking plants are renewables-enabling as they can help fill in the gaps when it’s not sunny or windy as well as support the growth of new technologies like electric vehicles (EVs). ELN took a tour of the facility – watch the video to find out more. Bloke ==> I once looked at this issue and realized, that in my neighborhood in the Central Hudson Valley of NY, where most homes have 100 amp drop lines from the power poles, that adding a Quick Charge EV charger to the already stressed 100 amp feeds would require upgrading all the power drop lines to modern 200 amp lines, which required upgrading the internal wiring to the power panel, replacing the power panels, adding dedicated wiring to the charger — and all that for only 1 EV per home. The average home in my area has 2.5 automobiles (most have two, many have three and four). If every home upgraded, the power lines on the poles would require upgrade and additional transformers would be needed. Bottom Line: We don;t have the infrastructure to support shifting to all EV transportation. I did not see any costs involved in this. I don’t think one government advisor has calculated what happens when a street of EVs plug in when their owners arrive home from work 50Kms away. Need the car to go to the Drs tough. A gas power station at the end of every street will be needed. If governments do not implement nuclear power, micro- or macro then energy rationing by smart metre is a certainty. Image of it’s not your turn, they switch you of and you cannot go to work. Who pays? Oh I know, we all work from home. So rising renewable share results in more CO2 emissions? These are obviously gas fueled diesel engines. So the answer to more renewables in the UK, South Australia, Tasmania and now Victoria means more diesels. Yes, they are internal combustion engines. The supplier’s own video says so. Facepalm time, as mentioned on numerous heretic blogs & Guardian etc. We must remember this is what we get when the government leaves the writing of the 2008 Climate Change Act to activists belonging to FoE which makes it all the more imperative that it, and everything hanging off it (subsidies for renewables) be repealed as soon as possible. http://euanmearns.com/the-origins-of-the2008-climate-change-act/ gives a rundown on what happened and maybe why. By my reckoning 4 of these units would enable us to chop down the wind turbines as they would be redundant. However one decent gas turbine facility would be more efficient and cheaper. Another gas turbine maybe could keep those EVs running; but these EVs should bear the cost of upgrading the grid and infrastructure. Meanwhile we are all? happy with our ICE transport. Does the job. Ivan, mention of the CCAct of 2008, reminds me that some little lassie named Worthington(?) is the wan wot wrote it (to quote Ernie Wise). It now appears she is one of those several involved in that European court ruling prohibiting the government using our money to subsidise the intervention market. Funny how the taxpayers always get shafted.